By using rainwater to supply water for some, or in certain cases all of our water requirements, we can reduce our dependence on municipal or well water. In many areas fresh water supplies are decreasing and in California water restrictions have been set in many communities to reduce water usage in order to protect our supplies. Rainwater falls for FREE – once rain harvesting systems are installed overall fresh water use decreases which can reduce water bills or the long term cost of operating private wells. Water suppliers will increase water service fees as they look to recover the true cost of providing water to communities. The construction of dams, pipes and treatment plants is huge and ultimately tax and rate-payers foot this cost. By capturing any amount of rainwater and reusing it, we can help reduce the need to use fresh drinking water for landscape irrigation, toilet flushing, laundry, heating and cooling and much more. Begin with long and thoughtful observation. Use all of your senses to see where the water flows and how. What is working, what is not? Build on what works. Start small and simple. Work at the human scale so you can build and repair everything. One thousand small strategies are far more effective than one big one when you are trying to infiltrate water into the soil. Spread and infiltrate the flow of water. Rather than having water run erosively off the land’s surface, encourage it to stick around, walk around, and infiltrate INTO the soil. Always plan for an overflow route, and manage that overflow water as a resource. Always have an overflow for the water in times of extra-heavy rains, and use that overflow as a resource. Maximize living, organic groundcover. Create a living sponge so the harvested water is used to create more resources, while the soil’s ability to infiltrate and hold water steadily improves. Maximize beneficial relationships and efficiency by “stacking functions.” Get your water-harvesting strategies to do more than hold water. Berms or swales can double as high and dry raised paths. Plantings can be placed to cool buildings. Trees can be selected to provide food. Continually reassess your system: the “feedback loop.” Learn from your work – we begin again with the first principle. Drylands and Beyond, Volume 1 by Brad Lancaster. Is Collecting Rainwater Legal in Calfornia? Rainwater collection is legal in California. In 2012, the Rainwater Capture Act was passed in Califonia which allows the use of rainwater collected from rooftops and does not require a water right permit from the State Water Resources Control Board. Indoor, potable use of rainwater does require a permit and can be the most challenging system to get a permit for. Rainwater tanks over 5,000 gallons require a permit, while smaller tanks don’t. According to California law the definition of “rainwater” means precipitation on any public or private parcel that has not entered an offsite storm drain system or channel, a flood control channel, or any other stream channel, and has not previously been put to beneficial use. As of 2017, the "Nonpotable Rainwater Catchment Systems" code is found in Chapter 16 of the California Plumbing Code (CPC). Before the Rainwater Capture Act in 2012 was enacted it was not legal to harvest rainwater in California without a water right permit. Millions of systems were installed anyway as rainwater harvesting is an ancient technology and has been used for millenia. Normally when it rains rainwater pours off the roof, down through gutters, off the driveway and other impermeable surfaces and runs into the street or other areas of the property. Rainwater harvesting is the practice of collecting and using this rainwater. Rainwater harvesting systems can be as simple as using a barrel to capture water or infiltrate the water into soil storage or it can be as complex as installing a large underground cistern or storage tank. Always start at the top of the "watershed". Think of the term watershed in this instance to be part of the larger natural watershed but more specifically the property boundaries that the rainwater harvesting system is being used for. In the urban or residential setting the top of the watershed is often the roof. The basic principal of rainwater harvesting is to channel rainwater from a catchment area (roof or other surface), through a conveyance system (gutters, downspouts and pipes/channels) to storage -whether that be in the soil or in containers such as a barrels or tanks. Often there may be rainwater filtration of some type to filter debris or clean out pollutants. Rainwater distribution take the water to desired areas of the landscape for use as irrigation or passive infiltration for nearby trees and shrubs . Finally there is the overflow system that ensures surplus rainwater is used beneficially in the landscape and prevents flodding and erosion. The total area of a landscape that drains to a particular site or drainage. As used in rainwater harvesting practice, catchment area refers to the area, such as a roof, that drains to a rainwater storage system -be that in a tank or in the ground. The highest water quality comes from smooth, impervious catchment surfaces. Impervious materials improve the efficiency of rainwater catchment systems by absorbing less water and reducing the chance for microbes and debris to collect in the pores and/or seams of the catchment surface. Smoother surfaces also allow the rainwater to flow faster and thus “clean” the catchment area. Metal, clay, and concrete tile roofing will generate the cleanest water. Catchment areas are prone to water loss to the environment know as a "run-off coefficient" -which is used when calculating the volume of water one can collect from a specific catchment area. Rainwater is usually conveyed from a catchment area to some type of storage (containers, infiltration basins or rain gardens) by gutters connected to downspouts. Downspouts with the aid of piping help move rainwater further. The number of downspouts needed depends on the surface area of the roof and intensity of rainfall. Downspouts can be fitted with filtration devices such as leaf eaters and first flush devices which exclude leaves and debris and filter out the first few gallons of water. Many types of first-flush diverters are readily available; all must be installed “upstream” of the storage tank. Passive rainwater harvesting systems utilize storage systems such as mulch basins, swales and other earthworks to collect and hold rainwater until it infiltrates into the ground. Active rainwater harvesting systems utilize manmade containers such as tanks, barrels and cisterns to store rainwater for use at a later time. See the next section for more information on Passive and Active Systems. Passive system distribution of rainwater happens before storage and can be simple overland flow of water using gravity and water's least path of resistence. 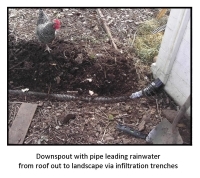 Piping from downspouts to earthworks like infiltration trenches can also be constructed to move rainwater where we want it to go -such as mulch basins or raingardens to irrigate specific plants. In an active system water distribution happens after storage and includes all piping, pumps, and other devices that moves water from storage to the point-of-use in the landscape -such as the vegetable garden. You cannot turn off the rain! Once your storage is full it's vital to have a plan in place for where the water will go. Design the rainawater overflow to be a resource so it can passively flow or spill over to mulched/vegetated areas, mulch basins or another series of earthworks (as shown in the photo above). Spillways (also called level sills) are low points in a berm-basin or swale system and are level surfaces to allow water to flow evenly across the land to another point of use. Diversion drains are a gradually sloping drains and can also be used for overflow; they are on a slight slope (<1%) to direct water to another area. Overflow routes should always be stabilized with rock, dense vegetation or other durable materials so fast moving water will not erode the land. Make sure the overflow route and spillway are large enough to handle all surplus water. The last and lowest point in your site's "watershed" should be directed to a natural drainage or in the case of urban settings, the stormwater system in the street. Whenever possible try to make sure all rainwater that falls on your land can stay on site to be fully maximized in the landscape. SLOW IT SPREAD IT SINK IT! Passive rainwater harvesting is the practice of slowing water down and encouraging it to soak into the ground. By building simple structures, rain and stormwater can be used beneficially, encouraging plant growth in landscapes and natural areas, healing erosion cuts, and can even replace the need to irrigate with tap water. Infiltration trenches and basins, swales, dry streambeds, and even pervious concrete or pavers are types of passive collection systems. Passive systems can be relatively inexpensive and are generally simple to design and build. Passive systems consist of a catchment area, a conveyance system, often a distribution system such as infiltration trenches and a landscape holding area or storage. Runoff is directed from the catchment area to the holding area, where water can be used by landscape plants. Catchment areas include soil surfaces, roofs, roads and sidewalks. Passive water harvesting can be used along with a active rainwater storage system, or can be used alone. Berms and swales are created perpendicular to the flow of water. The ground is shallowly excavated outside the plant dripline to hold water, while the berm helps detain the water a while longer. If using a berm with a swale, soil excavated from the swale can be used to build the berm. Berms can be constructed of soil, rock, straw bales, or other materials. Create infiltration trenches and basins. This distribution to catchment area includes shallow trenches which lead to basins or depressions (or raingardens) around plantings to supply water to several plants at once. They can also be shaped as donut rings around individual plants. Locate trees and shrubs in raised areas within or near the basin edge and do not allow water to stand around plant trunks or stems. French drains or dry wells are holes or trenches filled with gravel. Pipe‐less French drains direct rainwater water away from clean impervious areas (so silt does not clog them) allowing water to infiltrate into the soil in a more appropriate location and supply water to plants. Dry streambeds meandering through landscapes with rock “speed bumps” along the channel will slow runoff and encourage infiltration for use by nearby plants. Streambeds can have aesthetic value, creating a focal point in your landscape and provide the illusion of water. Passive Systems are inexpensive, simple to build, require little maintenance and turn your land into a sponge! NOTE: The basic components described here are for a non-potable storage system. A potable system would need to consist of all food grade materials, and water would need to be properly treated to meet drinking water quality standards. Potable rainwater catchment systems require a permit in California. Active rainwater harvesting refers to systems that actively collect, filter, store and reuse water. The storage is usually the most visual aspect of an active system (i.e. large tanks), but they also generally incorporate pumps, and sometimes filters that require electricity. These are active components that require regular ongoing maintenance to run efficiently and effectively. Distribution System – used to move water from a container to the desired area of the landscape for irrigation. The smoother and more impermeable the collection surface, the less debris will accumulate, keeping the stored water cleaner. Catchment area to gutters to downspouts to pipes to tanks. Dry Pipe – This method involves a larger storage volume. Essentially, the collection pipe “drys” after each rain event since it empties directly into the top of the tank. Wet Pipe – This method involves locating the collection pipes underground in order to connect multiple downspouts from different gutters. The rainwater will fill the underground piping and the water will rise in the vertical pipes until it spills into the tank. The downspouts and underground collection piping must have water-tight connections. The elevation of the tank inlet must be below the lowest gutter on the house. This type of system allows for more flexibility in storage tank location. Proper pipe sizing is important to prevent flow backup, and pipes are susceptible to freezing. To keep water clean, prevent clogging and sediment build-up, basic filtration is needed. The type and number of filtering components on a system depend on the amount of roof debris. First flush diverters keep the first flush of poor quality roof runoff from entering the tank. Diverters must have a drainage outlet for emptying standing water, and be emptied as needed. Diverters are usually not needed unless water quality is especially poor (i.e. significant bird droppings on collection surface). A strainer basket or screen at the tank water inlet serves as further protection from debris and animals. Do not allow the basket to sit below the water line and clean frequently. Multiple containers can be connected together to increase storage capacity; they can be linked at the top or the bottom. The distribution component of active systems includes all of the piping, pumps, and other devices that move water from the storage to the point-of-use in the landscape. If irrigation is by gravity flow, the distribution system may be a length of drip tubing or simply a hose. Pumps: If rainwater is used in a drip irrigation system, moved long distances or uphill, a pump may be needed to pressurize the system. Without a pump the water will be pressured by gravity. There are many different types of pumps, either external or submersible. Each rainwater harvesting system is unique and should be thoroughly evaluated when designing the system. How much rainwater could be collected in specfic rainfall events and how much water is expected to be used are only two of the many things to consider. All decisions will affect installation cost, operation, and on-going maintenance. What will the rainwater be used for? How will water get from the roof to storage and to the final area of use? 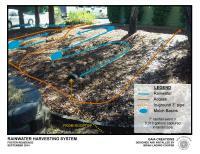 Do you want a passive system that moves water to a raingarden? 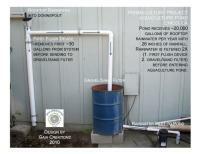 Do you want a simple active system that moves water to a rain barrel? Do you want a complex active system with multiple tanks? Will the system be gravity fed, or will it need a pump? If you use storage containers, where can they be located -above or below ground? Will you want the option to expand the system later? Where will rainwater overflow go? 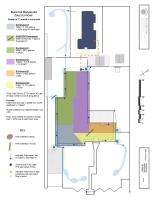 If you want potable water indoors, can you get a permit? Is the roof material suitable? Can the containers serve several purposes where they are located- like serving as shade for the garden, a windbreak or the edge of a structure? There are two methods for calculating the potential volume of rainwater one can collect in a designed system. There is the easy way and the longer way. As with most things there is more accuaracy with the longer route. The first thing that needs to be done however is to determine the square feet of catchment area. Our example is for a rectangular rooftop (for different shapes and sizes of catchment areas visit Brad Landcaster's website here). Rooftop catchment area is equal to the total square feet of the house plus the extension of eaves. To calculate the square feet of the house’s catchment area, measure the area of the outside walls and then include the overhang of any eaves. For example, let’s say the house is rectangular with outside wall dimensions of 36 feet by 46 feet. The overhang of the eaves is 2 feet on all sides. Add 4 feet of the eaves to each wall length (2 eaves of 2 feet equals an additional 4 feet for each wall) to get the total length of the walls plus the eaves (36 + 4 = 40 feet and 46 + 4 = 50 feet). Now multiply 40 times 50 (length times width) to get the total roof catchment area. When working with a rooftop take the view of a falling raindrop, and only look at the “footprint” of the roof’s drip line. It does not matter whether the roof is flat or peaked; the roof dimensions at the drip line are the same. It is the footprint of the roof’s drip line that matters. Gabling of the roof is another consideration when determining volume as it will split the drainage area and rainwater will flow to one downspout or another. One inch of rainfall on 1 square foot catchment area provides approximately .6 gallons of water. The theoretical house has a 2,000 square foot catchment area so you multiply .6 gallons by 2,000. If the average rainfall is 20 inches per year, one has the potential to collect 24,000 gallons of water in one year. Below shows the average precipitation for 4 cities in the local area. You can find data here for your area. If the roof consists of two or more rectangles, calculate the area for each rectangle and add them together. With conical, octagonal, or other non-standard roof shapes, again calculate the area based on the drip line. For a round roof, use Pi times radius squared to figure the catchment. You should consider that rainwater harvesting systems aren't necessarily 100% efficient. All rainwater harvesting systems lose some of the rainwater to the environment, known as a ‘runoff coefficient’.